Download Your Exclusive Content ! Shalom! 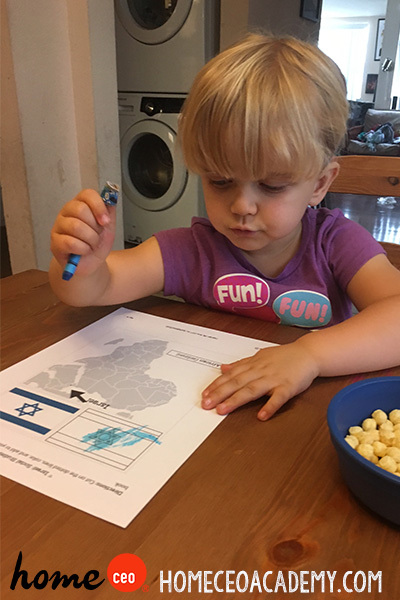 We continued our trek across Africa this week and learned about Israel! Here are some highlights from our week. 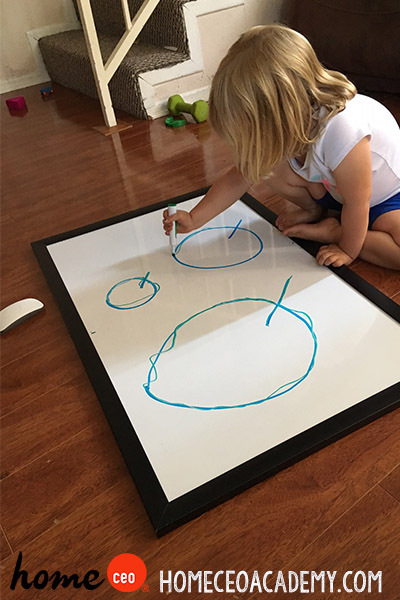 We had to move our circle time board to a high shelf in Kylie's bedroom due to a certain grabby little brother, but I love our new set up now! Kylie wakes up, takes a peak out the window to observe the weather and then adjusts the calendar. What a great way to start the day! The letters of the week were Q and R. One of the wake up, warm up activities in our language block had Kylie writing Q's and R's in different sizes. 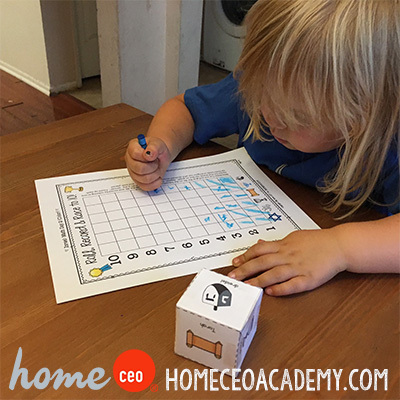 The math wake up, warm up activities focused on 1:1 correspondence. 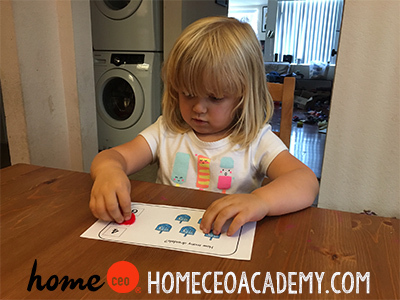 Kylie counted the dreidels on the card and then placed a pom-pom on the corresponding number. We made a star of David during our art block. "Momma, that doesn't look like a star. Its two triangles!" Kylie said. 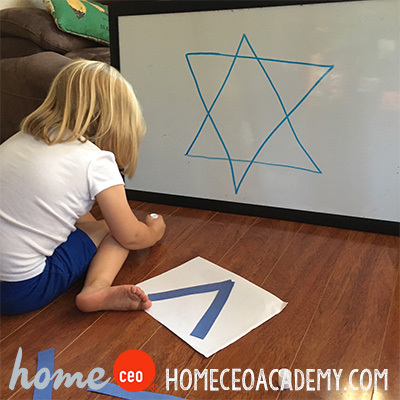 **Home CEO Hack** Please, please, please don't be intimidated if you do not have the exact materials for certain lessons. 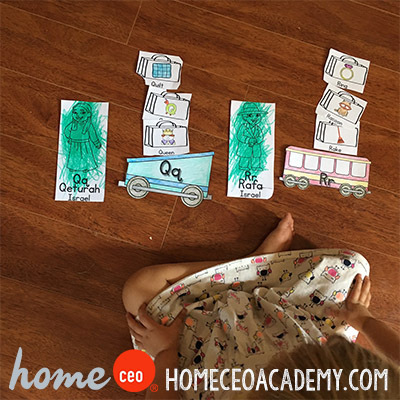 Home schooling does not have to break the bank! 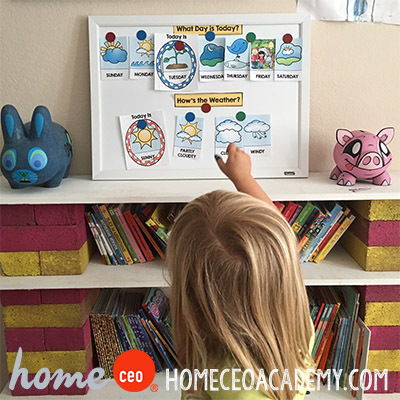 Homeschooling does not have to involve stressful, last minute trips to the store clothes pins or water beads! Be resourceful. This project called for blue crafts sticks, but I don't have any so I cut up blue paper. And you know what? She still had fun! 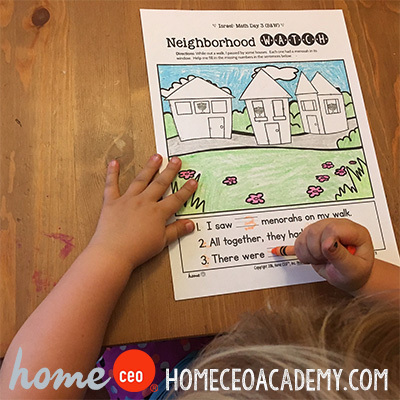 Our math worksheets this week were loads of fun! Confession time... we played the "Roll, Record, and Race" game four days in a row. 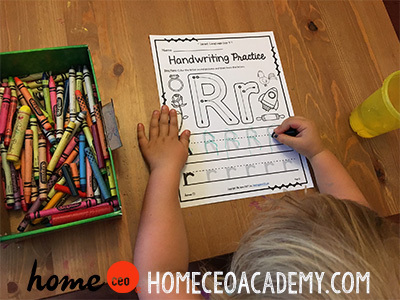 Handwriting is this young lady's least favorite activity, but she is slowly warming up to these worksheets. "R looks like a P with and extra leg," Kylie told me when she was done. 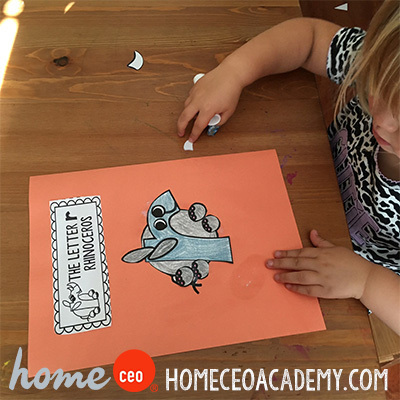 The letter crafts never disappoint! 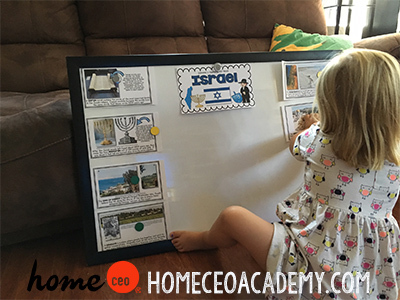 Our theme board this week was filled with cards highlighting Israel's beautiful landscape! I love cooking. 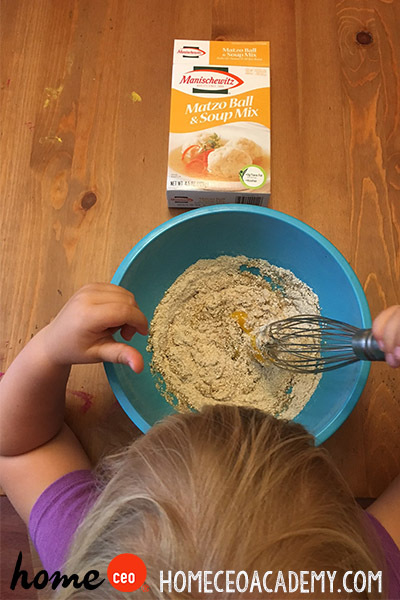 I want my children to love cooking. 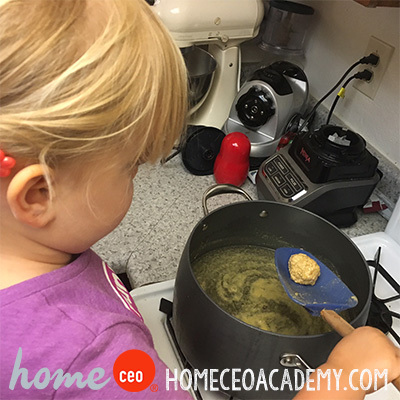 Practical life skills are a tenant of Montessori education and I don't think you can get more practical than preparing food! We made matzoh ball soup this week. 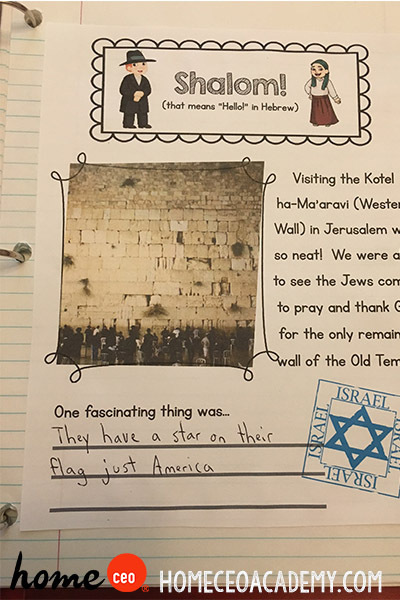 I just love the social studies worksheet we do on day 3 each week. We always hop on the computer after and look at different maps and see what counties or bodies of water are touching our country of the week and how far it is from where we live. That wraps up our Israel unit. I can't believe our first semester is almost over! If you would like to join us on our trip, you can purchase our 12 week, first semester "Exploring Our World" curriculum set here. Did you find this post helpful? Share the love & spread the word! Connect with Us & Join the Conversation! © Copyright 2018 Home CEO ™, a social enterprise initiative of The Adsila Retreat, Inc..
© Copyright 2016 Home CEO ™, a social enterprise initiative of The Adsila Retreat, Inc..